Medulloblastoma is the most common malignant brain tumor of childhood, with an overall mortality of 40 to 50 percent. Surviving children often have significant long-term cognitive and physical sequelae resulting from existing treatments. Therefore, identifying and understanding the genetic events that drive these tumors is critical for the development of more effective therapies. In the 2 August issue of the journal Nature, Brandeis Biochemistry faculty member Daniel Pomeranz Krummel contributed his structural biological expertise in collaboration with colleagues at Children’s Hospital Boston, Dana-Farber Cancer Institute, Harvard University, the Broad Institute (MIT), Stanford and the Hospital for Sick Children in Toronto. The paper titled, “Medulloblastoma exome sequencing uncovers subtype-specific somatic mutations,” unravels a landscape of mutations that are peculiar to medulloblastomas. This paper represents a landmark study of medulloblastomas. More specifically, Pomeranz Krummel’s collaborators noticed that a protein called DDX3X had numerous mutations in medulloblastoma. Pomeranz Krummel was able to create a structural model of DDX3X that provided insight into the functional significance of the critical mutations in children with medulloblastoma (below, image). DDX3X is an ATP-dependent RNA helicase. 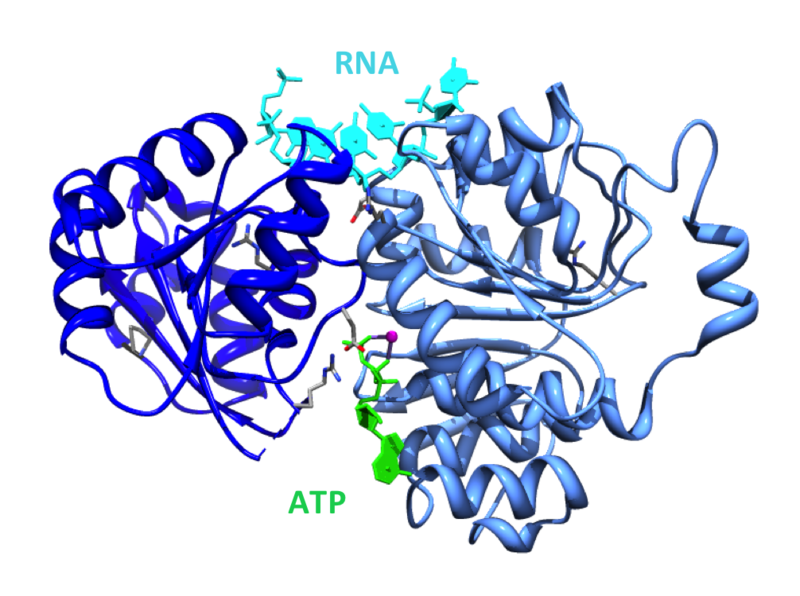 RNA helicases are fascinating proteins that function to drive the restructuring of RNA and/or RNA-protein assemblies, and have proven to be of great importance in cancer biology and HIV research. Pomeranz Krummel’s long-standing interest is in RNA-protein interactions and application of methods to visualize the enzymes critical to processing of RNA in the human cell. Thus, thinking about the structure-function relationship of this RNA helicase DDX3X was a problem of much interest to Pomeranz Krummel. This collaboration involved forging links between basic and translational scientists, thus giving rise to promising new horizons of treatment options for children with medulloblastoma. Complex signal processing in synthetic gene circuits using cooperative regulatory assemblies. Generation of human brain region-specific organoids using a miniaturized spinning bioreactor. Restriction and modification of deoxyarchaeosine (dG+)-containing phage 9 g DNA.